How to use disclosing tablets the best way! The Mystery Of Disclosing Tablets Explained! I think disclosing tablets are great, and I recommend them to all my patients. They can help you to prevent gum disease. But what are they and what do they do? They help you to see the plaque that is on your teeth, so you can clean it off better. Plaque is a thin tooth-colored film of bacteria, and it can be very difficult to see. 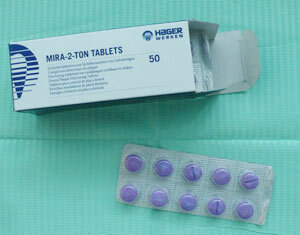 Disclosing tablets are small chewable tablets that contain a type of vegetable dye. This dye is attracted to dental plaque, and so will show you where the plaque is building up on your teeth. That plaque is just full of bacteria. When we clean our teeth, the whole point is to get rid of that plaque bacteria. Not just food debris. Just because you haven't eaten anything for 12 hours doesn't mean your teeth are still clean - plaque bacteria starts to collect on your teeth again within minutes after brushing! And this layer of plaque is microscopically very sticky - it sticks to your teeth, ESPECIALLY AT THE GUM EDGES. That bacteria will cause gum disease, making the teeth loose over time. Plaque bacteria also causes inflammation to do with heart attacks, stroke and diabetes. Did you get those front teeth clean? How can you tell? Maybe there's some plaque left between your teeth? What about the backs of the teeth? You are probably missing some teeth every time you brush, without realizing. 1. Wait until evening. 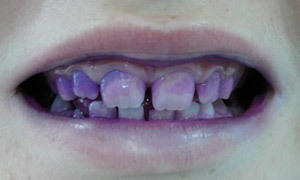 The vegetable dye in the tablets can stain your gums a little bit for a few hours. Some tablets use a red dye, while others use a blue dye. Either way, your gums may look a little odd for an hour or so if you use them in the morning! 2. Brush your teeth like you normally do. You can even cheat a little - spend a little longer on each tooth! Then rinse out. 3. Now, chew a disclosing tablet for about 30 to 60 seconds. Just crunch it up between your teeth, and smear it all around your teeth with your tongue. After you have done that for 30 to 60 seconds, rinse out with water a few times. Really swish it around to wash out all the excess dye. Now it's the moment of truth! Take a look in mirror at your teeth. Make sure you have good bright lighting, and really look closely at the edges of the gums, and in between the teeth. The dye will stain any plaque that you missed when you brushed. Look closely at the gum edges, and between the teeth, where the teeth touch each other. The plaque will be a blue or a red color, depending on the make of tablet. Brush again! You'll want to use a good toothbrush to get the most plaque off. But this time, you can see exactly where the plaque is sitting, that you missed first time around. That plaque is just seething with bacteria, attacking your gums! For my opinion on which toothbrush to use, have a look at Best Sonic Toothbrush. So slowly brush around each stained area, spending at least 10 seconds or so per tooth. This is important. Move the brush very slowly in a circle, round and around, on the same tooth until you see all the stain has gone. If the stain has gone, so has the plaque. On the other hand, if you can still see some staining from the disclosing tablet, that means there is still bacteria-laden plaque sitting on your teeth. If it is between the teeth, you will really need to use some dental floss to get rid of it. You can find out how at Oral B floss. Congratulations! By taking a bit of extra time to use disclosing tablets, you have just got rid of a bunch of bacteria from your teeth, and reduced your risk of gum disease!